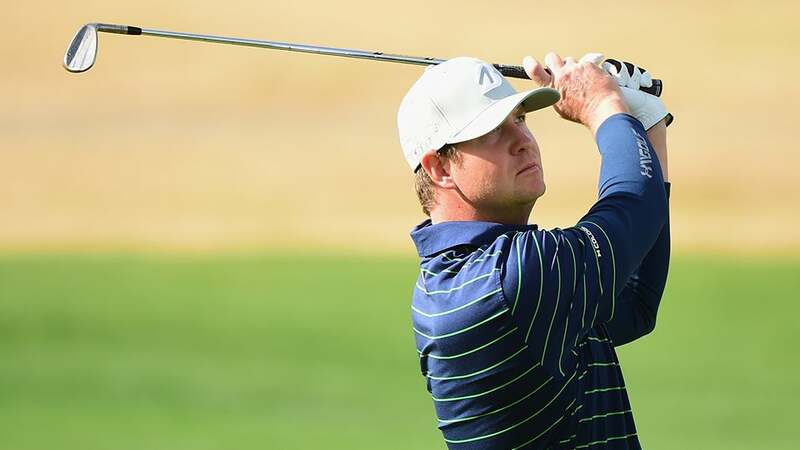 Hudson Swafford picked up his first career PGA Tour victory at the CareerBuilder Challenge on Sunday in La Quinta, California. LA QUINTA, Calif. (AP) -- A day after making a mess of the 16th and 17th holes on PGA West's Stadium Course, Hudson Swafford birdied them Sunday to take control in the fittingly named CareerBuilder Challenge. A few minutes later, with rain approaching the desert over the snow-capped mountains, the 29-year-old former Georgia player celebrated his breakthrough first PGA Tour title and first Masters spot. "They don't give them away out here. It's not easy," Swafford said. "I've been close. I've been in the heat lately. Just keep putting myself in position, and this just feels unbelievable." He tapped in for par on 18 for a 5-under 67 and a one-stroke victory over Adam Hadwin, the Canadian who had trouble scoring after a third-round 59 at La Quinta Country Club. "I can't help but be slightly disappointed," Hadwin said after a 70. "I really wanted to come out here and kind of prove that yesterday was just kind of a continuation of some good play and kind of get it done today, but I got beat. I felt like I did all the right things. Just a couple shots here and there and who knows what could have happened. But an incredible week, my best finish ever." Swafford tied Bud Cauley for the lead with a 12-foot birdie putt on the par-4 15th, and pulled ahead with the birdies on 16 and 17 - a day after dropping three strokes on the daunting duo. "Stepped up there and hit some really good shots on those two holes, knowing what happened yesterday," Swafford said. "I was just really confident on those two holes today. I knew the bad stuff on those holes were gone. I had already seen it, it had already happened, and just visualizing really good shots." On the par-5 16th, he hit a 4-iron 230 yards to 12 feet - staying out of the 18-foot deep bunker he hit into Saturday en route to a double bogey - and two-putted to take the outright lead. "Just trying to maybe chase it up on the front edge, and it was probably my best swing of the day," Swafford said. "It was just right out of the middle, flew on the green. I thought it was actually even going to get closer than it did. But after what happened yesterday, I was really satisfied with that." He hit to 1 1/2 feet on the par-3 17th, a day after barely clearing the giant rocks that ring the island green called Alcatraz. "It was just choke up and swing an 8-iron and it ended up being perfect," he said. Hadwin also birdied 16 and 17, making a 25-footer on 17 after Swafford tapped in. Swafford found the fairway with a 3-wood on the par-4 18th with water along the left side, then avoided the water again with an approach to the right side of the green. He lagged his 20-footer to 2 inches. Hadwin's final drive settled in the dormant Bermuda an inch from the green rye rough and his approach stayed right and settled into a bad lie in the thick dormant rough. He saved par to finish second alone. "I would have loved to have put a little bit more pressure on Hud coming up the 18th," Hadwin said, "but just to be able to get up-and-down from the lie that I had from over there was pretty impressive." Swafford finished the pro-am event at 20-under 268 and earned $1,044,000. He opened with a 65 at La Quinta, shot another 65 on PGA West's Jack Nicklaus Tournament Course to take the second-round lead, and fell two strokes behind Hadwin with a 71 on Saturday at the Stadium layout. Swafford got off to a rough start in the final round in the chilly morning, three-putting for bogey on the par-4 first, and was five strokes behind leader Chad Campbell after five holes. The winner rallied with birdies on Nos. 7-9 to join Campbell and Hadwin atop the leaderboard. On the par-5 eighth, Swafford cut a 5-wood into the middle of the green and lipped out for eagle. "The game just felt comfortable from there on," Swafford said. "I just felt like I could hit any shot where I wanted to and just felt in total control." Cauley and Brian Harman each shot 69 to tie for third at 18 under. Campbell holed out from 108 yards for eagle on the par-5 fifth, then made a triple bogey on the par-3 sixth - hitting into the water and three-putting. He finished with a 71 to tie for sixth at 16 under. Phil Mickelson shot a 70 to tie for a 21st at 11 under in the 46-year-old Hall of Famer's return from two sports hernia surgeries. "I think this was a good start for me for the year," Mickelson said. "The only way to find out where your game is at is to play in competition. ... I'm much further along than I thought I would be."